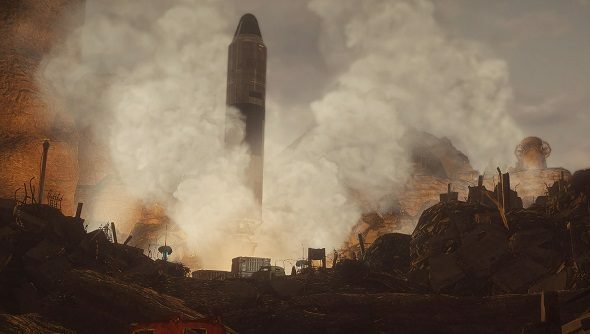 Long before there was anything such as a 24-hour teaser livestream for Fallout 76, Brandan Lee began working on a mod called Fallout Project Brazil. Now called Fallout: New California, it’s ready to launch, and the team behind it has announced that it will be coming out October 23. Fallout: New California is a total conversion mod for Fallout: New Vegas, and it serves as an unofficial prequel to Obsidian’s entry in the franchise. It’s set in New California and involves the NCR faction that figured heavily into New Vegas’ storyline, but there’s a massive amount of new story, weapons, locations – basically, everything you’d expect from an official Fallout title. Fallout: New Vegas is on our list of the best RPGs on PC. The last time we checked in with Fallout: New California, Lee had planned on 5,000 lines of new voice acting to the mod, and he says they’ve written 16,000 total. Now Lee says the main storyline is completed, and between now and the October launch date he wants to add in side quests and recruit beta testers to find out if anything is still broken. The team has also put together a narrative trailer for the mod, which you can view below. There’s a lot going on, and while New California has its own distinctive look and tone, it’s still instantly recognizable as Fallout, even if it isn’t official canon. Something particularly striking is how many characters they have on screen at once – this was extremely rare in Fallout 3 and New Vegas, so I imagine they’ve had to do some fighting with the engine to make these large battles work, assuming they aren’t scripted events for the trailer. Lee writes on the New California ModDB page that the team will be holding signups for the beta in July. They’ll be opening a Discord server at that time, so stay tuned if you’re interested in helping test the mod.